Keeping up with heavy demands of pizza-craving customers at your restaurant or pop-up eatery calls for a quality, heavy-duty commercial pizza oven. You need a commercial pizza oven that will maximise output without compromising quality, leaving your pizzas cooked to perfection every time. If this sounds like the type of oven you are looking for, then this Heavy Duty Mobile Pizza Oven is certainly up for the job. Ideally suited for commercial use, this pizza oven is reliable and heavy-duty for everyday use. Made from double stainless steel, this portable commercial pizza oven is resilient and hard-working. Weighing in at 18.5kg, this oven is relatively light and compact, making it ideal for events and outings. Whether you are looking for a commercial pizza oven for events or to use at a restaurant, this option offers speed and quality. 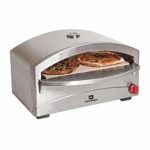 With a stone base, this commercial pizza oven heats up in just 5 minutes and can cook 2 small 6 inch pizzas (or one large 12 inch pizza) in just seven minutes. It offers a cooking area of 510mm x 340mm and can output around 8 large pizzas an hour. Simple controls, including a temperature dial on the front and clear thermometer gauge on the hood, make cooking with this pizza oven effortless. Its safety valve – fitted with thermocouple technology – keeps your pizza cooking at high temperatures while minimising the risk of fires or damage. This Heavy Duty Mobile Pizza Oven is can be fuelled with either propane or butane gas. It is fitted with a piezo ignition, making it simple to ignite and easy to use. This oven reaches around 400°C in 5 minutes, which is perfect for cooking both thin and thick crust pizzas fast. Though it doesn’t use brick or wood, this pizza oven cooks on a traditional refractory stone base, ensuring the classic pizza taste. The control burner system balances heat within the oven to suit any style of pizza and give you a perfect outcome. And pizza isn’t the only food you can cook in this oven. Biscuits, flat bread and other delicacies can be cooked in this commercial gas pizza oven with ease, giving great-tasting results every time. Although this pizza oven is categorised for commercial use, it is a little on the small side and may not suit busy and bustling restaurants. If you are looking for a large scale commercial pizza oven then why not consider the North Pro FPD 152 Commercial Electric Twin Deck Pizza Oven.